Old solutions are often so elegant and effective that they keep coming back. 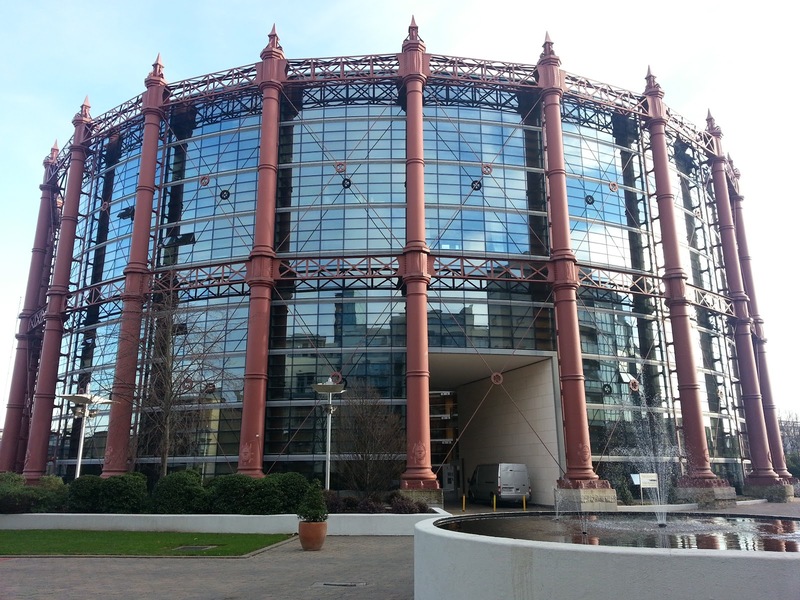 The gasometer, or gas holder, is one such example. Now [NightHawkInLight] has built one for storing the wood gas he’s been experimenting with, and it’s pretty neat to watch it rise and fall as he first adds gas and then burns it off. The mechanism couldn’t be simpler. For those who, like us, are hearing about this low tech for the first time, gasometers are a means of safely storing gas stemming from the 1700s when gas was king and electricity was little more than a gentleman scientist’s pursuit. In its simplest form, it consists of a container of water with another container filled with gas sitting upside down in the water. Gas pressure is controlled by the weight of the gas-filled container and the water provides a seal, preventing the gas from escaping. Adding gas simply raises the gas-filled container, and removing or using gas lowers it. Simple, safe, and elegant. We’ll leave the details of how he made his gasometer to the video below, but suffice it to say that his use of a double-walled gas pipe originally intended as a furnace chimney just adds more elegance to this whole hack. [NightHawkInLight’s] cool projects have graced the pages of Hackaday before. For example, in the area of gas alone there’s his propane-powered plasma rifle, his transparent hybrid rocket engine, and his thermic lance which was hot enough to melt rocks. This is how we store the gas from our bio-methane digester. For the final version, he needs a pump in between because wood gasifiers run under vacuum. He’s doing destructive distillation in a batch, whereas wood gasifiers are continuously operating furnaces where the fuel provides both the heat for the pyrolysis and the feedstock for the gas, which is controlled by reducing the air intake. This makes for greater efficiency since no heat is lost in an external burner – the fuel just burns incompletely. That means the chimney needs negative pressure to pull the air in through the intake choke. Usually this is provided by the engine that is running on the gas. In old town gas systems, coal was burned in an oven with excess air until hot enough, and then the air intake and the chimney were closed and water sprayed on the glowing coals, which caused a water shift reaction and a positive pressure inside the furnace from the steam and gas, which was hosed into gas bells. Then the valve was closed and the furnace flaps opened before the fire went out. It was a risky business as you couldn’t see inside the furnace while it was generating gas, and leaks would happen, and in any case when the cycle was done the furnace would be full of flammable gasses that could ignite explosively once you open the air intake again. Oh, and there’s also some modern gasifying central heating systems where the wood is burned in an insulated box and the gas is collected and burned in a separate box under the water tank. In these systems, the flue provides the negative pressure by updraft, or a fan if the draft isn’t strong enough. The point is that the wood gas burns cleaner since all the soot and tar is collected before it reaches the actual burner, and the furnace power can be neatly controlled so you can have a smouldering fire going on in the insulated box that makes the wood last longer when you don’t need as much heat. The condensation water in his tubing is red – what causes that? Anyone know what chemical is given off in the gassification process that’s both soluble and red? Likely the rosin from the pine sticks he’s using. Refined rosin is normally yellow but unrefined varies from black to red. A reservoir bypass just after the pipe and before the hose would help to eliminate that problem. And using bronze torch valves would greatly increase the safety of it, instead of using what looks to be a sink or toilet water valve. If I ever have a property of my own, I think I might like to set up a gas forge upscale this little set up. Using an array of gasometers like his, maybe marking the outside of the inner chambers with their approximate psi at different values to tell at a glance. And maybe using a decommissioned oxygen tank as the charcoal chamber. Just to upscale it. A welding regulator could be used to ensure that gas isn’t wasted while powering the forge, and if the rocket stove can be made to produce more charcoal than it strictly has to use, then it won’t be a waste of fuel, because the extra coal can be used in place of the gas when needed. I’m not sure what his plans are for the wood gas, but he’s going to need to dry the gas for more serious use — the water vapor in the gas stream will quickly wreck an engine. Maybe a CaCl2 or zeolite or silica gel dryer? Or a length of pipe stuffed with steel wool. Push the gas through a chilled pipe, collect the water as it condenses on the inside? intercooler? Since the gas coming out of a gasifier is hot, that’d help cool it down and help condense vapors. It’d still need filtration for tar and alike. In cars using wood gasifiers after WW2, there was a bubbler box where the gas went through, and in some models through multiple sheets of wet cloth. Neat! 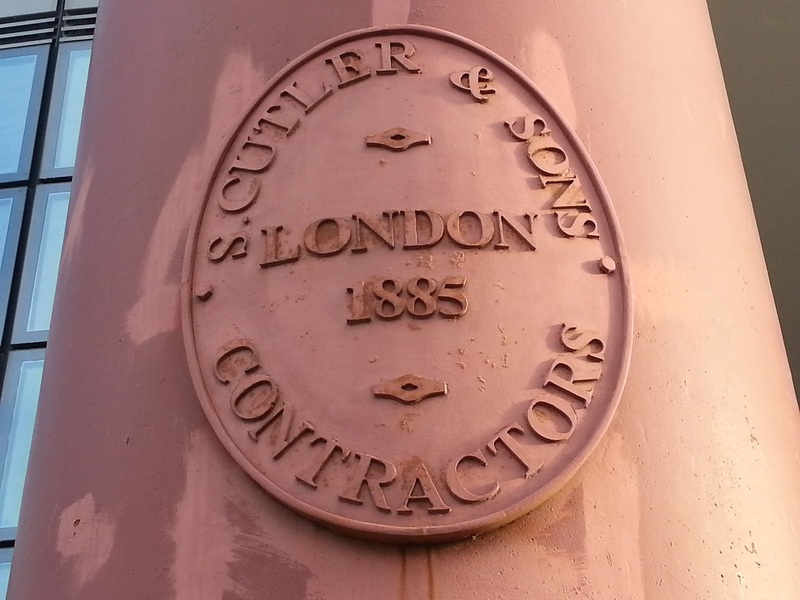 If you’ve ever noticed an odd old building in your town, usually a cylinder with few windows and a domed roof, this might be what lived in there. I can’t say about others, but the gas holder in Troy, NY was cast iron, so the upper portion provided significant gas pressure by its own weight alone. Even though the pressure in gas systems are measures with inches of water units, the pressure can’t exceed the pressure gassifier can produce. I would suspect in a practical system there was a gas pump between the gassifier and this vessel. This is a cool video, with lots of good techniques. Using hot glue to make a temporary junction – pouring epoxy resin to make a plug – pouring down the seam to make it air tight? Wonderful good stuff in that video.! I was like “Why?” when he poured that epoxy on the side of the tube, and was like “Oh” when he explained it was dual purpose to seal the seams as well. Never would’ve thought of it, or at least not after I noticed water dripping out of the system. Gassification process also creates an enormous amount of CO. Very common to find people in their kitchens dead with a tea kettle on the stove. He does mention this in the video, that it’s about half CO. Also the origin of putting one’s head in the oven. Damon good! Never heard of this before, gives me some ideas. It is funny how people look at different ends of the beast. I have made wood gas in a large 55 gallon drum, but not because I wanted the gas, because I wanted the beautiful had wood charcoal. It is neat though that once you get the drum hot enough for the wood to start gassing watching the flames shoot out of the bung. The other interesting thing is that you stoke the barrel full before the baking process and when you are done the volume in it is down by about a third. When I make charcoal I look at it as a highly inefficient process. It takes a lot of fire to bake out a 55 gallon drum full of wood. Likewise, it seemed that he used much more fuel to extract the gas than he managed to capture, and the amount of gas was nothing, With just that little flame you could see the level sinking. I had a friend who was playing along those lines a few years back but he was using a gasoline powered generator to run an induction heater to heat the wood, and the idea was that once the wood was gassing well to switch the generator over to running off the wood gas and compress and store any excess. For me, I will just stick with making charcoal. In an efficient downdraft gasifier, you get about 75% of the energy in the wood at the cost of 25% to heat it. If you heat it by electricity and pipe the resulting wood gas through an engine generator, you lose 3/4 of the energy, so the whole thing’s not going to return any excess. The problem is the genset, because wood gas has low energy per volume, so the engine will be all out of sorts trying to run on it. 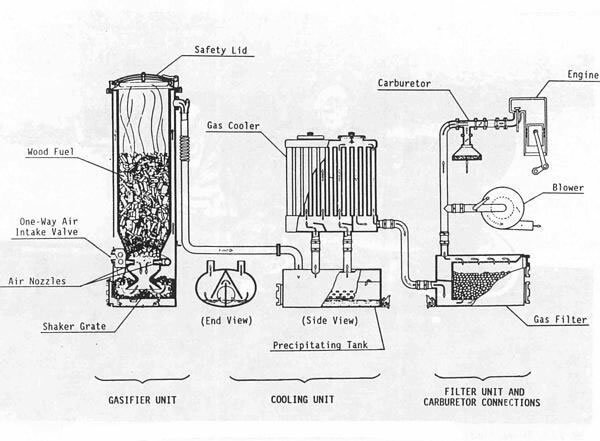 How does the downdraft gasifier work? I would love to burn less wood per batch of charcoal. Right now the setup in a 55 gallon drum with a C closure on one of the ends. That sits between two metal rails on a metal rack I welded up that is about 3′ off the ground. That goes roughly in the center of a bonfire we keep stoked up for a couple of days and occasionally when it dies down enough, we will rotate the barrel before stoking it back up. It is a long and not overly fun process, but the charcoal is amazing to cook over. Somehow this is a very lossy process. Wouldn’t it be possible to run the wood gas to burners below/around the heating vessel to omit the losses of the genset with it’s internal combustion engine (>2/3 of the energy are lost there)? The original charcoal processes basically consisted of an incomplete combustion in a covered pile of wood. They were quite time consuming, but somehow a more modern version of this should be possible. An interesting project and I enjoyed watching the video. To have practical and safe system, many more components and engineering has to be involved. Any gas has to be dried before entering the distribution system. I suspect additional particulate filtration would Ne needed. This build suggests that the gas produced would be used for fueling gas appliances. The video suggests that wood is consumed to gamify wood. Why not used that wood in appliances that consume the wood directly? While I was aware that producer gas systems preceded heating oil, electrical power and natural gas I had never given mich thought to it’s infrastructure. Thanks for posting. Visit driveonwood to see wood gas at work . is this generator is suitable for home use?